Cryosurgical tips enable a wide variety of cold application during cryosurgery procedures. Disposable plastic shields insulate tips and keep them sterilized. 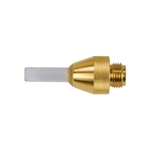 Medical Device Depot sells all cryosurgical tips and shields from Wallach. Call us at 877-646-3300 for more information or to make a purchase!